The quick pitch: This is the chance to see these two legendary, wide-open masters of high energy music and proprietary extended wind instrument techniques in Orlando. The long read: Although this was a late addition to the cm5 2013 playbook, we gladly altered our careful work to make this a reality in town. View this concert both as a visceral fireworks-laden affair and as a pocket fundraising for all of you that have offered to help at varying levels. Since the reemergence of the Civic Minded 5- spurred on by the existence of the building of the Timucua white house- we’ve only asked for an admission for one other concert after altering our model from tickets to regular patrons (the cm5 members) and freely donating friends compelled by the music. 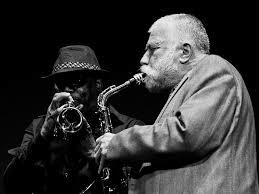 Peter Brötzmann and Joe McPhee, while born and raised during a very different time for their respective countries of Germany and the U.S., would be drawn to similar revolutions in the arts and are now known as regular collaborators in the world of improvised music, free jazz and world music. Both gentlemen started recording creative jazz-based music in the 1960’s. Both have had prominent record labels started to release their music. Both began as second-generation artists driven by “The New Thing” of Cecil Taylor, Ornette Coleman and Jimmy Giuffre- all of whom were able to make readily available recordings to disseminate a more open, bracing language for jazz music. The combined discographies of Brötzmann and McPhee hovers between three and four hundred releases. You can make some connections between Peter Brötzmann’s visual arts pedigree and his later developing musical career. The reedist’s still-produced paintings have strong emphasis on color, texture and shape, opposed to detailed replications of extant imagery. That’s a fair jumping off point for Brötzmann’s playing on soprano, alto, tenor, baritone and bass saxophones, a-clarinet, e-flat clarinet; bass clarinet and tarogato. The same departure point can apply to his compositional styles, never tracking very close to the American jazz musicians- including The New Thing pioneers- that provided the original impetus. The multi-reedist has developed and applied another pan-ecstatic, ritual music frame appending to his American predecessors and contemporaries, which were first strongly rooted in the blues form, eventually supplanted by pan-African and Far Eastern forms. Like many of his contemporaries, the America free music was suffused with the music and teachings of Karlheinz Stockhausen and John Cage. By the mid-1960’s, Brötzmann had toured with the world-traveling Don Cherry and returned to Germany to define the ground floor gestures of the countries’ new jazz scene. Bassist (1990’s cm5 concertizer) Peter Kowald, pianist Alex Von Schlippenbach, trumpeter Manfred Schoof, and drummer Sven-Ake Johannson. 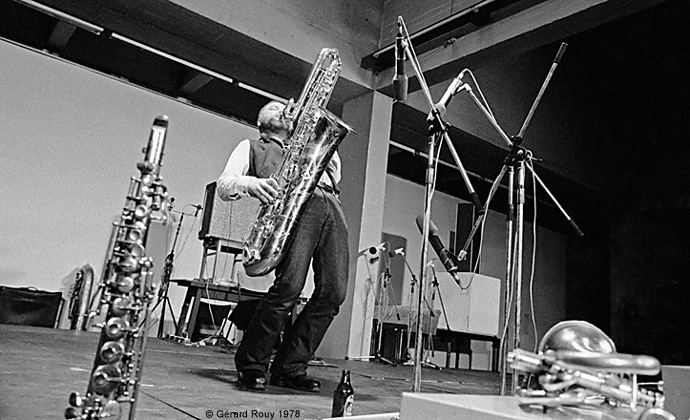 Aggregates of these players resulted in Brötzmann’s entry into DIY record making via 1967’s For Adolfe Sax and 1968’s iconic, rumbling freedom of Machine Gun. A long-standing trio of pianist Fred Van Hove and drummer Han Bennink- both previous cm5 guests- could be sourced via Berlin resident Jost Gebers’ Free Music Production (FMP) label. In addition to this trio, Brötzmann has been involved in a number of iconic outfits. 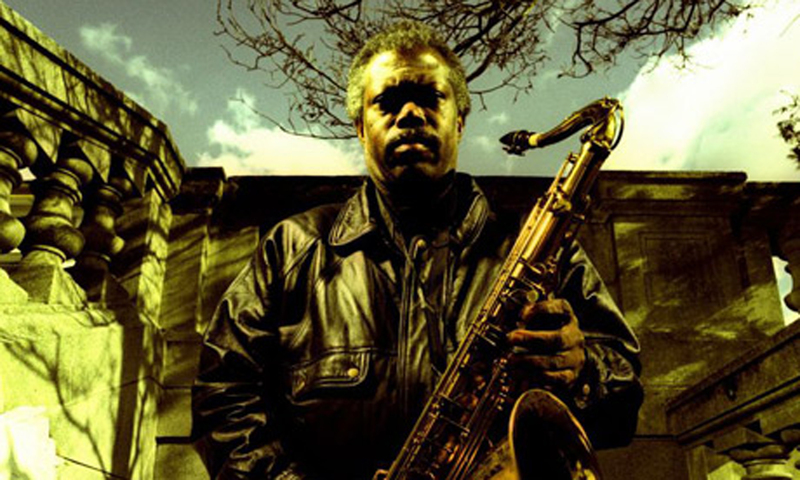 The saxophonist was one surface of the gritty, diamond-hard electric jazz quartet Last Exit, with guitarist Sonny Sharrock, electric bassist Bill Laswell and drummer Ronald Shannon Jackson. A one-time Chicago project with Brötzmann has endured as the Chicago Octet/Tentet, full of composers and conductors including Joe McPhee. Joe McPhee’s unusual aesthetic/instrumental flexibility could define his both his legendary status within the creative jazz music scene and the relative inability for a listener to sum up McPhee’s career with the catchphrase or conversational soundbite. If we were to arm you with your McPhee talking point, we could start with his tenor saxophone continuum along the lines of John Coltrane’s 1964 to 1967 astral, Pan-African spiritualism. He was first on record in 1969 with trombonist Clifford Thornton’s Freedom and Unity album, followed by again available releases Nation Time and Underground Railroad. In 1970 the Swiss label Hat Hut (later Hat Art and Hatology) started to release McPhee’s work, amongst which his solo statement Tenor arose. His collaborations on the three figure count discography echoes Don Cherry’s world travel with stops to record with another of the waiting myriad creative aggregates. Joe McPhee has appeared as a distinctive voice on tenor, alto and soprano saxophones, trombone, clarinets, pocket trumpet and valve trombone. Amongst McPhee’s best-known reoccurring projects include Deep Listening Band collaborations with electronic and minimalist legend Pauline Oliveros, Trio X with bassist Dominic Duval and drummer Jay Rosen, and the afore-mentioned Chicago Octet/Tentet project. Manhattan’s free music State Of The Union-harkening Vision Festival honored Joe McPhee with their Lifetime Of Achievement in 2012. Looking back, McPhee appeared with electric guitarist Davey Williams and shakuhachi player Philip Gelb at the sonorous Rollins College Knowles Chapel in 1996 for one of the first proto-cm5/WPRK concerts. The multi-instrumentalist narrowed his focus to the soprano saxophone and pocket trumpet, ringing out the warm acoustics during the trio’s take on Duke Ellington’s sacred music standard Come Sunday and a solo take of his signature theme, Voices. The Monday, June 3rd concert is your Orlando chance to witness two senior masters of their forms, both as soloists and duet partners. This rarified event amongst a week-long U.S. tour also doubles as a chance to participate in raising funds for more cm5 leaps of faith. Buy tickets here to support the cm5. Tags: Civic Minded 5, cm5, Joe McPhee, Peter Brötzmann, Timucua Arts Foundation. Bookmark the permalink. Berlin resident Jost Gebers’ Free Music Production (FMP) label. correct is the following URL http://www.fmp-label.de only! Jost- Updated in the article. You don’t often get a chance to see Brotzmann on these shores. Hope you take advantage of it. Yes. Florida- in a robust and enthusiastic showing- unlocked the Brötzmann and McPhee badge last evening.